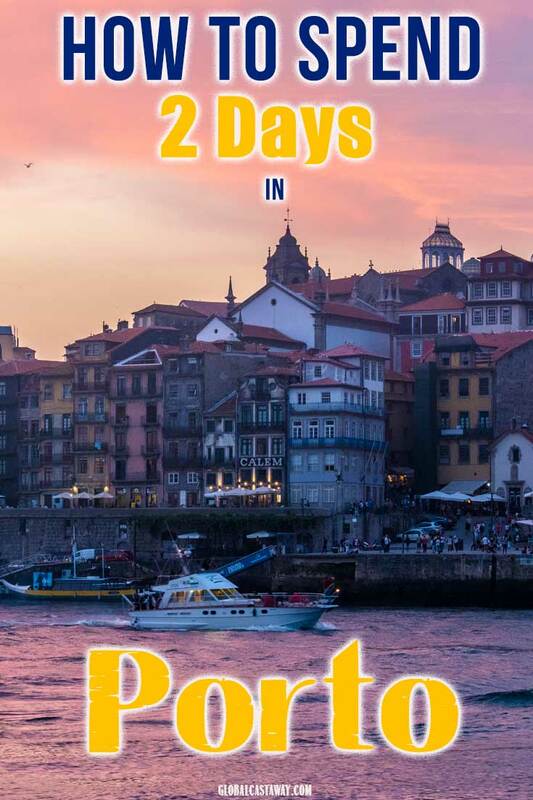 You are about to spend 2 days in Porto? Congratulations, you’ve made a great choice! 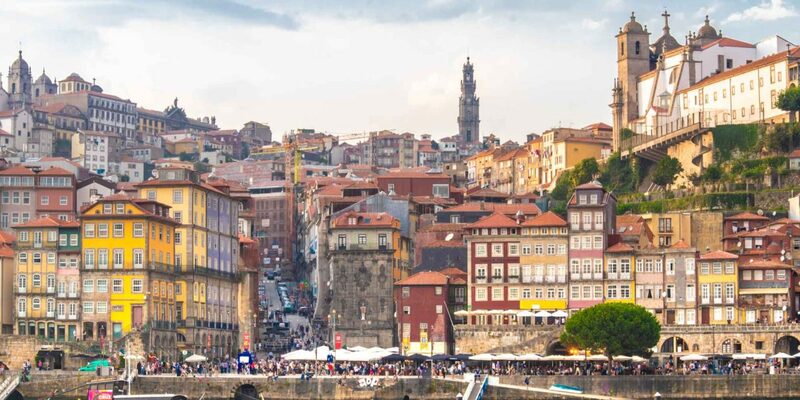 Even though Porto is the second largest city in Portugal, for some reason, a lot of people leave it out of their European itineraries. Big miss for them and great news for all of us, who’ve decided to spend a few days in Porto – the most underrated city in Europe. 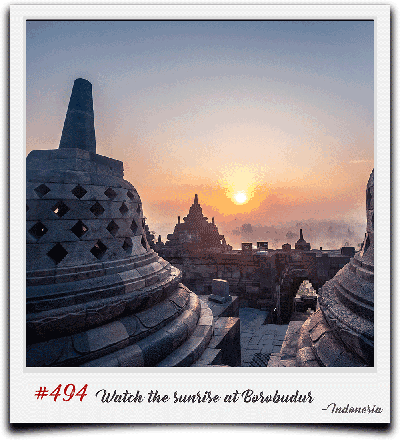 Now you may wonder, if this is the second largest city in the country, are two days enough to explore it? 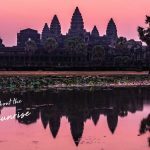 Since most of the landmarks are close to each other and the tourist crowds aren’t that big, 2 days would give you just enough time to taste the spirit of the place. I need to warn you though, once your 2 days in Porto are over you’d be sorry you’ve spent so little time there, and you’d be already planning your return. 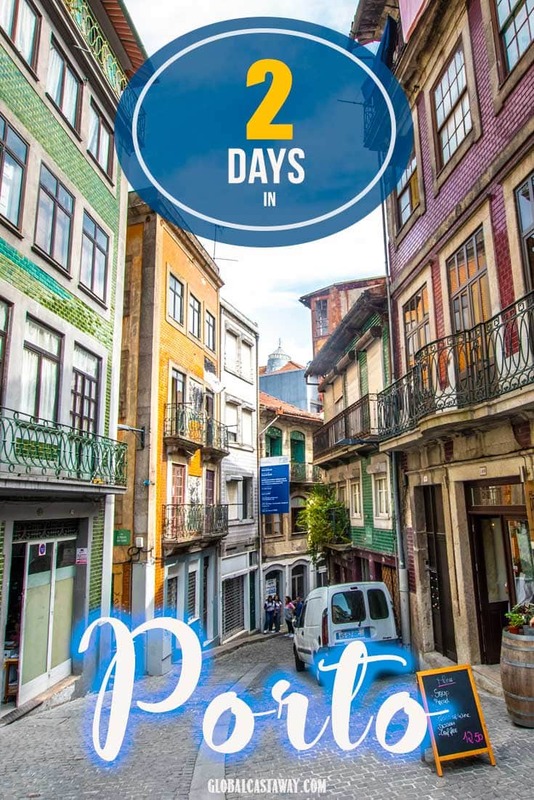 The itinerary in this guide presumes you have 2 full days in Porto. It is however structured for a slow and easy-going tempo. 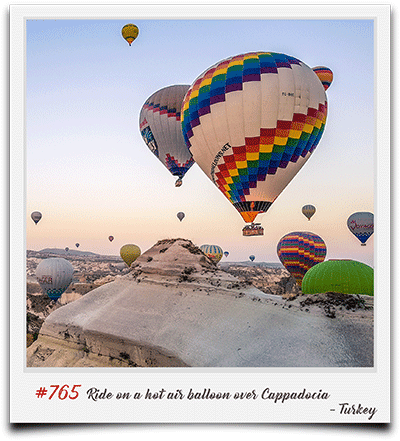 If your time is limited or you prefer a quicker pace, you can visit all of the mentioned spots in a single day. I do recommend going slow though, hastiness goes against the essence of the city (and the whole country of Portugal). 3.2 When to go to Porto? 3.3 How to get around Porto? Do you know that the author of the most famous wizard in the world used to live in Porto? Between 1991 and 1993, Joane Rowling was teaching English in the Portuguese city and it’s considered that she got a lot of her wizarding world inspiration right there in Porto. So let’s start our city exploration with one magical bookstore. I’ll be honest with you – this is the most controversial place on my list. 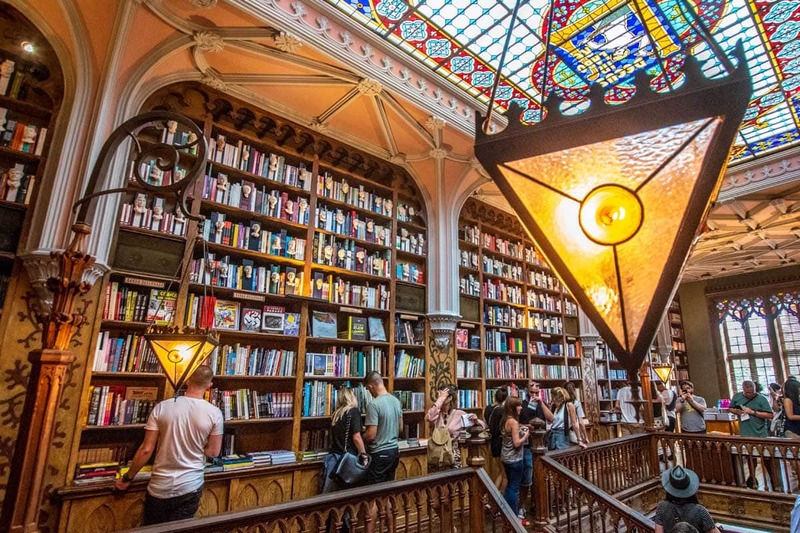 Since 1906, Livraria Lello has been the house for men of arts and letters, an inspiration for acclaimed authors, a place for social gatherings, performances and a quiet library for many readers. Nevertheless, since one of those authors used to be J.K. Rowling, today the livaria is anything but a quiet place to enjoy a book. The store got so popular that they even put an entry fee (that gets deducted from the book price if you get one). So why did I put this crowdy little bookshop first on my guide? Well, the architecture is truly one of a kind. Crowded or not, the antique bookstore has managed to preserve this early 19th-century spirit inside. With a giant wooden forked staircase connecting the first and the second floors, and even bigger stained glass window on the ceiling, this will be the most beautiful shop you’ve ever set foot into. Overcrowding is a big problem though, that’s why I put it first on our itinerary. Get there half an hour before it opens to have the chance to enjoy this architectural masterpiece, but be prepared to share it with at least a dozen other people. If you go there later in the day though, you’d have to share it with hundreds of others. If you really don’t want to get up early on your vacation, go to Livaria Lello an hour before closing, when the crowds are more manageable. 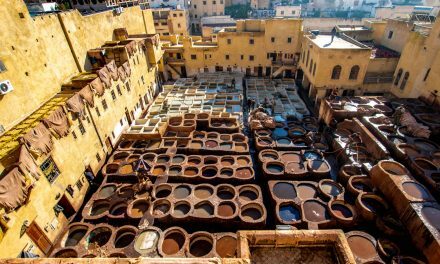 Who should go to Livaria Lello? If you are a Harry Potter fan, it’s a must-go for sure. 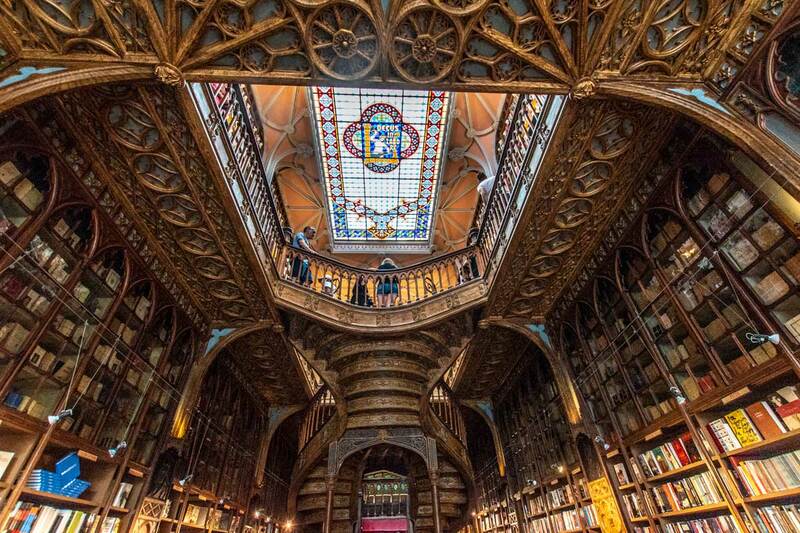 This small Portuguese bookstore inspired Diagon Alley’s premium bookstore – Flourish and Blotts, and honestly is one of the best places to go if you want to feel part of the wizarding world. If you enjoy reading or have a friend who does, a book from one of the most famous bookstores in the world is a wonderful souvenir as well. If you don’t care about Harry Potter, architecture or books, you better leave it out of your itinerary. CastawayTip: The ticket for the bookstore is bought in an alley nearby. To avoid waiting on two lines, get your ticket online from the official site. Right across Livaria Lello, you can find the fountain with the lions. The magnificent fountain decorated with four seated lions is responsible for the square’s namesake. An odd thing about the lions is that they have wings making them more griffins than lions. You see where I’m going to, Potterheads? Yes, the fountain is believed to have given inspiration for the Gryffindor house’s mascot. 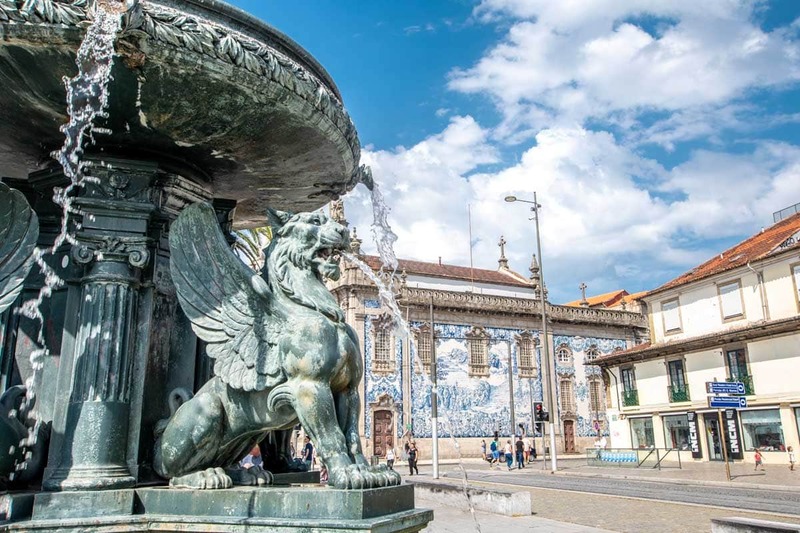 Since the fountain is located right behind the University of Porto, it is a favorite meeting place for the students. And the students in Porto are an attraction by themselves. Being one of the oldest educational institutions in the country, the university has a ton of traditions, one of them being the school uniforms. Leather case, a tie, white shirt, blazer, and skirt for the women, with pants and an interior jacket for the men, finished with a black cloak. Sounds familiar? They are exactly like the school uniforms in Hogwarts! The fountain and square are a nice place for the non-Potter fans too. 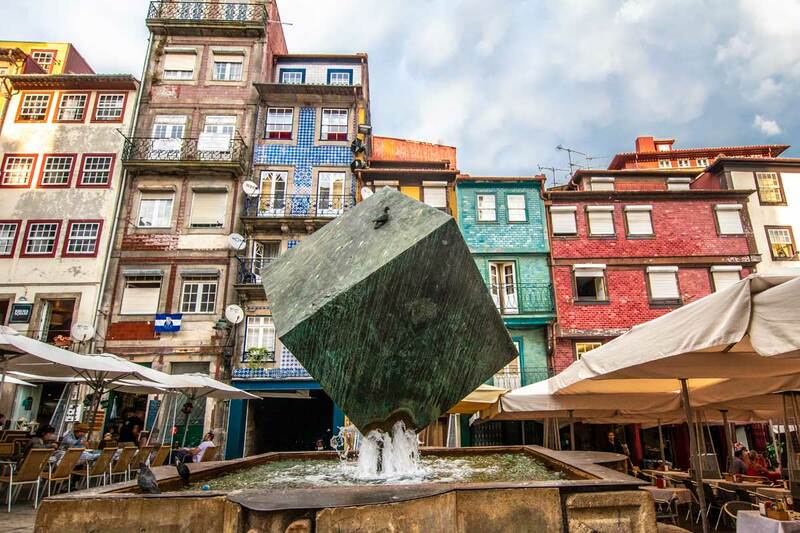 With an alley full of traditional Portuguese souvenirs (a lot of cork stuff) a tram stop and even a small truck selling port wine and tapas, you’d enjoy the four lions fountain and square even without knowing what Gryffindor is. CastawayTip: Don’t call the students – Harry Potters. Most of them hate it and prefer their old nickname – the bats. Do you enjoy tapas and wine? The best place try them is in Madrid, see what else is there to do! 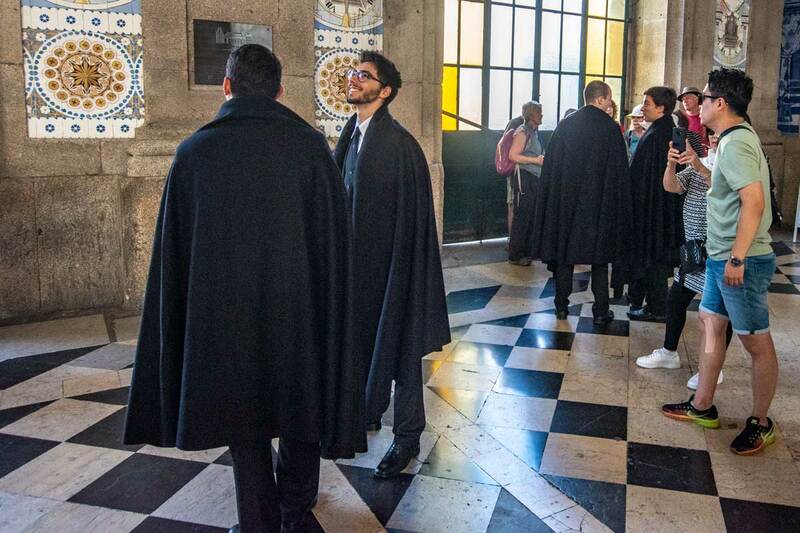 It’s time to pause the Harry Potter tour and continue with the other distinguished landmarks of Porto – the churches. The Carmo and Carmelita churches look like one large church from the outside, but after close examination, you’d find that they are two different ones, separated by one of the world’s narrowest houses. 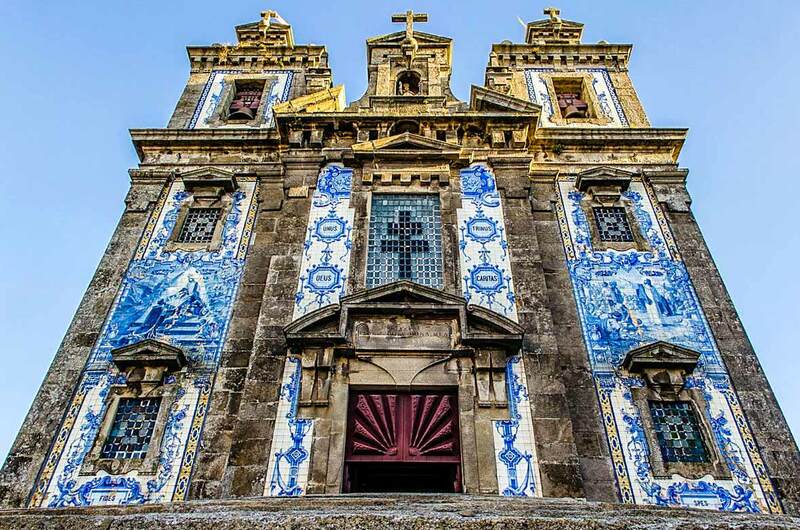 Being a fantastic example of baroque architecture, the two churches are a great introduction to the stunning architecture you’re going to enjoy on your two days in Porto. The biggest highlight of the site is the outside wall of the Carmo church. 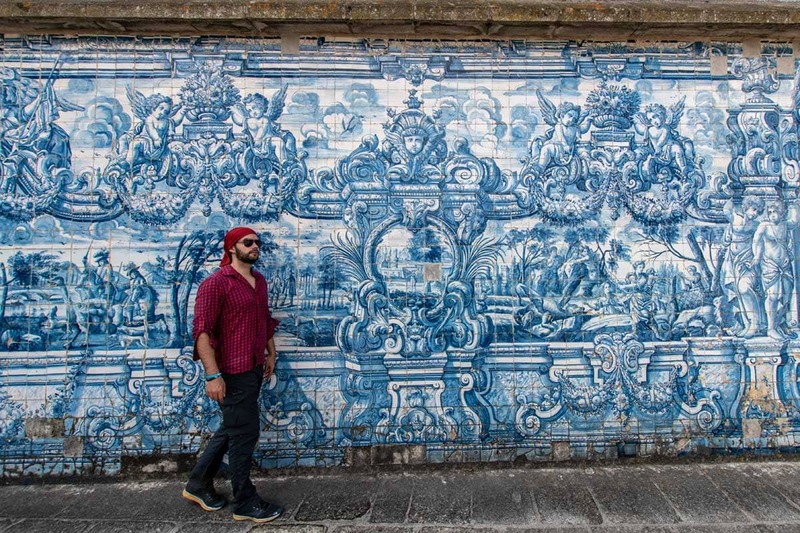 Decorated with a massive panel of Portugal’s signature blue and white azulejo tiles, the wall had become a favorite spot to get that perfect Instagram photo. 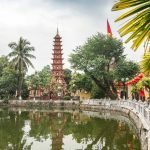 CastawayTip: A hawker will try to lure you to see the small house between the churches. Don’t go for it. It’s just a few floors of single rooms with old furniture. See how todo it on your own! We continue our two days in Porto with another church. 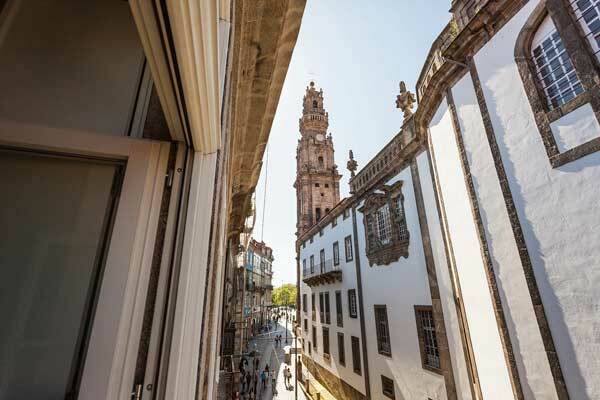 Short walk away from Carmo and Carmelita is a building that defines the skyline of Porto – the Clerigos church. Just like the previous churches the center of our attention won’t be the house of God. This time it’s the bell’s tower. 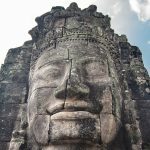 Depending on the day and time of your visit (weekends and midday are most crowded), you may have to wait on a line for a while. And since the space on the tower is limited, your ticket would have a fixed hour. 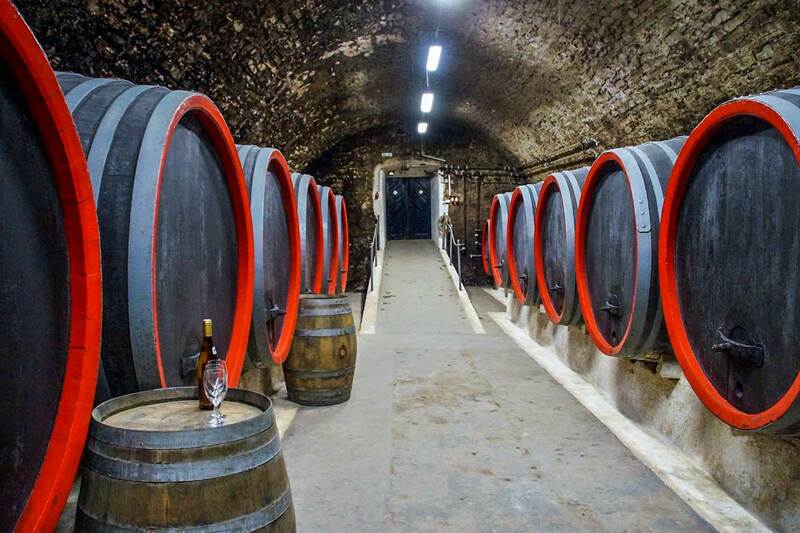 That gives you time to explore the interior of the Clerigos church, have lunch in the restaurants nearby or enjoy a glass of Port wine in the nearby park. 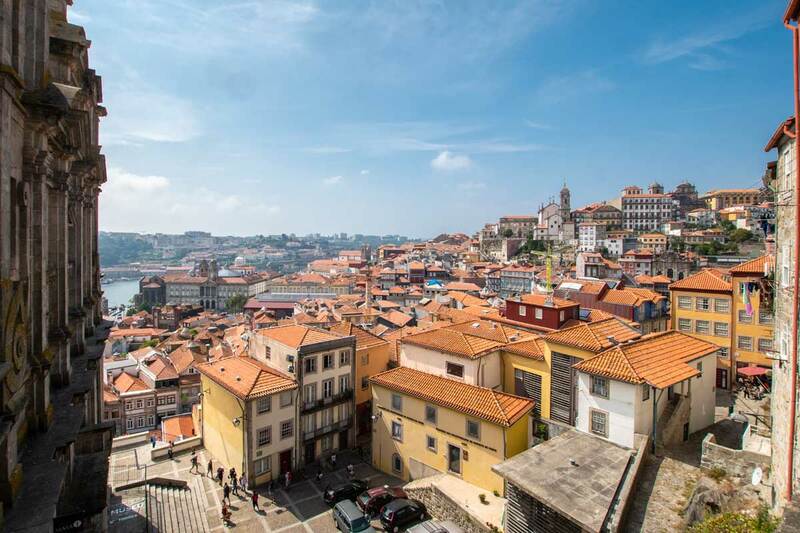 Once the time comes, prepare for 225 steps and the most beautiful panoramic views of Porto. A quick walk from the Clerigos church will lead you…Actually no. Take your time and enjoy the colorful houses and antique shops in the heart of the city while slowly making your way to one of the most beautiful train stations in the world. 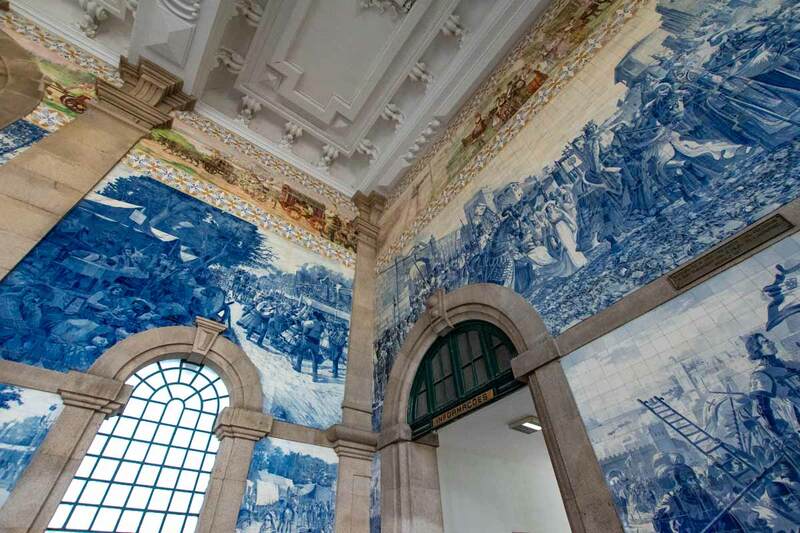 Built in the end of the 19th century, Sao Bento is decorated with more than a 20,000 magnificent azulejo tin-glazed ceramic tiles depicting Portugal’s illustrious history. Working hours: The station should be open all the time, the ticket offices though work from 6:40 am to 8:35 pm. 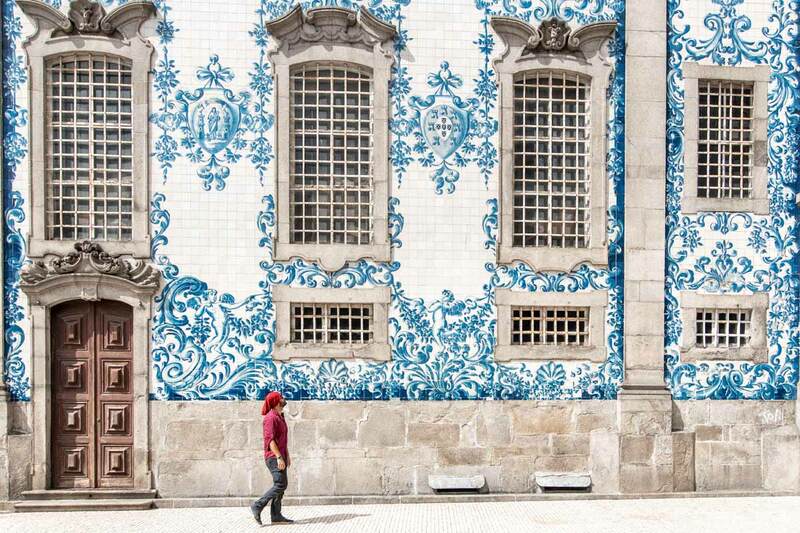 I hope you liked the tiles of Sao Bento, cause our next destination has a lot of them. 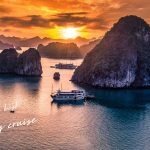 From one of the most picturesque train stations in the world, we are going to one of the most picturesque churches in the world. Welcome to Igreja Paroquial de Santo Ildefonso. Isolated on a small hill, the tiny church is built in a proto-Baroque style and has a facade of nearly 2000 azulejo tiles. Illuminating the streets of Proto since the 18th century, Igreja Paroquial de Santo Ildefonso is one of the most instagramable places in the city and a must-see spot on your two days itinerary. Monday: 3:00 pm. to 6:30 pm. Tuesday to Saturday: 9:00 am. to 12:00 pm. and 3:00 pm. to 6:30 pm. Sunday: 9:00 am to 01:00 pm and 6:00 pm to 8:00 pm. 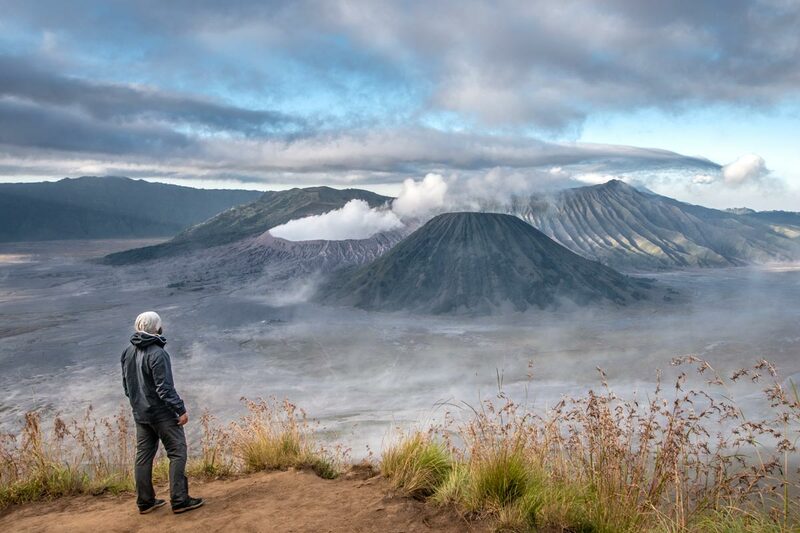 The last place for the day is a place you can also start your day at. 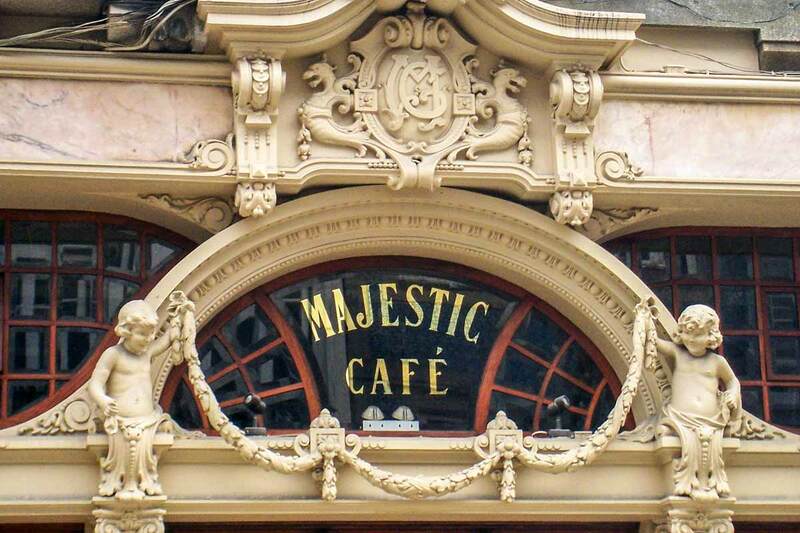 Founded a hundred years ago, the Majestic Cafe has been voted continuously among the most beautiful cafes in the world. One of the top meeting points of the elite of the city after the first world war, the cafe lost its glamour during the second one. Bought and renovated in its original style in 1983 however, Cafe Majestic once again becomes one of the most famous attractions of Porto. It is even rumored J.K. Rowling wrote the first chapters of Harry Potter on a napkin there. 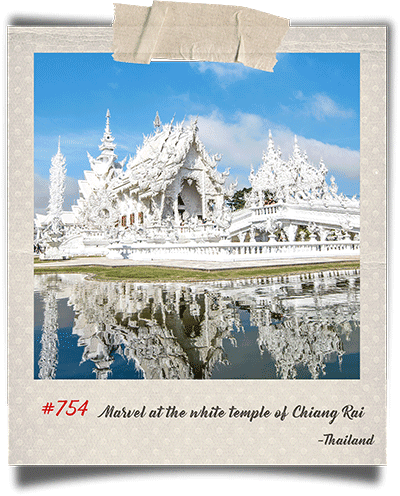 CastawayTip: If you are a budget traveler, this is not a place for you. Keep going on the Santa Catarina Street, and you’ll find a ton of other wonderful little cafes with lower prices. Our second day in the city will be centered less around Harry Potter and more around the local atmosphere. We would try to capture the soul of Porto. Let’s start the day with a walk around one of the most beautiful districts in Portugal – Praça da Ribeira. 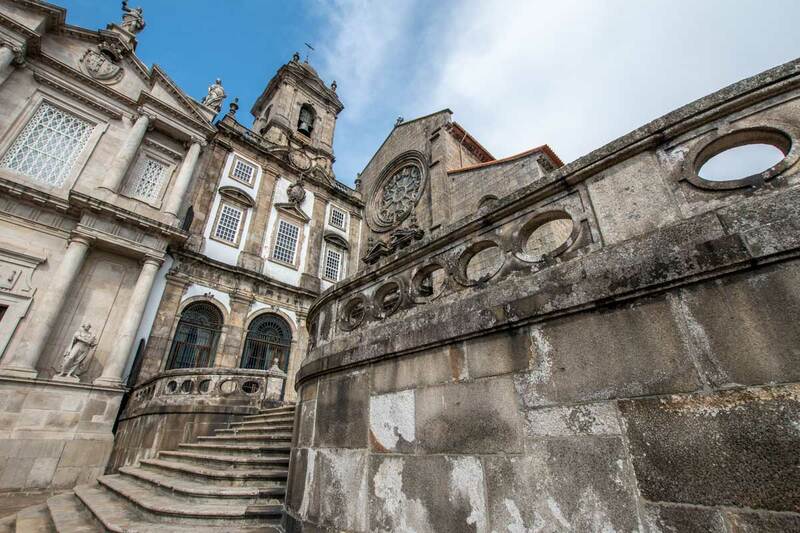 Located alongside the Duoro river, the area has been a UNESCO World Heritage Site since 1996. 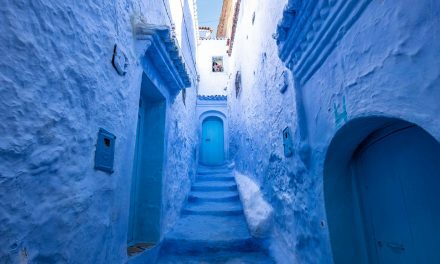 The winding medieval streets and small cobblestone alleyways complemented by the sounds of various street performers and the smell of freshly baked Pastel de Natas are guaranteed to make this walk a memorable one. Have a seat in one of the riverside cafes and enjoy the Duoro breeze while sipping a cup of strong Portuguese coffee. Next on our itinerary is one of the most significant buildings in Porto. Built between the 12th and the 13th century, the Porto Cathedral is one of the most symbolic tourist attractions of the city and is often used as the poster landmark of Porto. The brilliant blend of Romanesque, Gothic and Baroque styles is finished with large ceramic tile (azulejos) panels making the building a must-see for every architecture enthusiast. Make sure to check the cloister too. 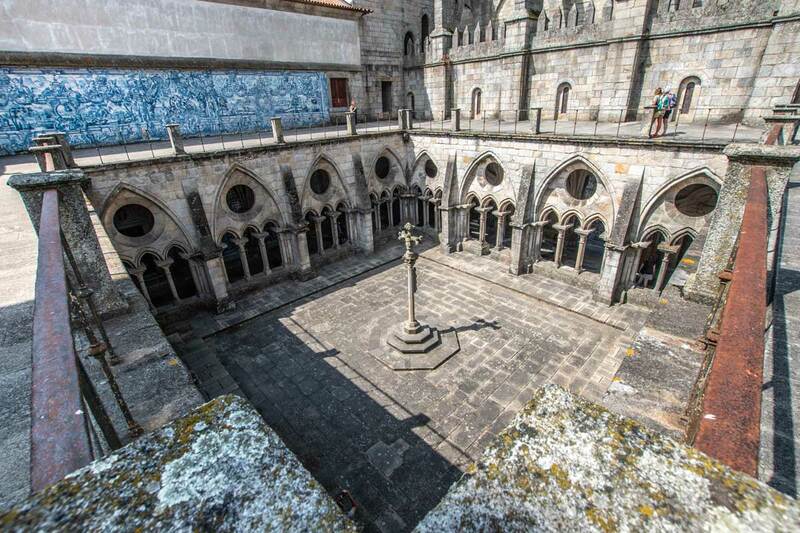 Right in front of the Porto Cathedral, you can find one of the best miradouro (viewpoint) of the city. Don’t miss it! April – October: 9 am – 12:30 pm and 2:30 pm to 7 pm (Cloister: 9 am to 6:30 pm). November – March: 9 am – 12:30 pm (Cloister at 12:15 pm) and 2:30 pm – 6 pm (cloister closes at 5:30 pm). The Cloister only opens in the afternoon on Sundays and religious holidays. CastawayTip: The Cathedral is very quiet, cool and has plenty of seats. If you get tired while walking around town, it’s a great place to go and find refuge from the blazing Portuguese sun. 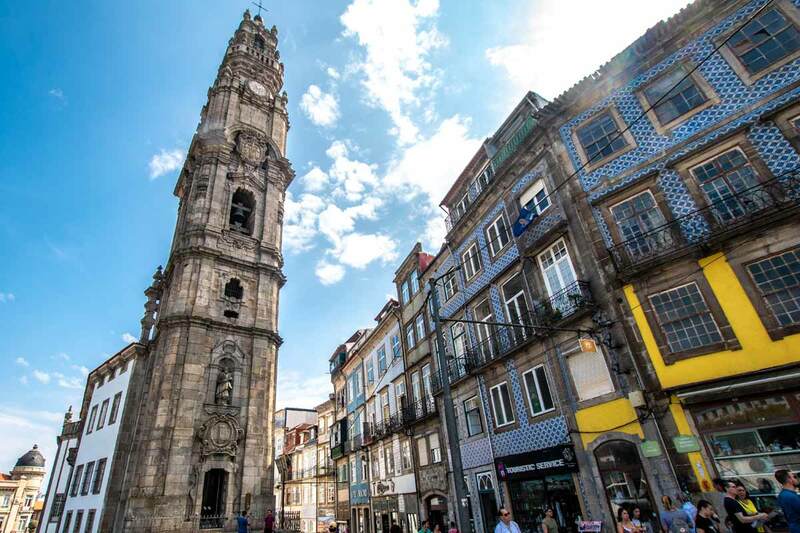 Our 2 days in Porto itinerary continues with yet another church. It’s the last one, I promise! It’s also the most beautiful of them all. Yep, I saved the best for last. Behold – the Igreja de São Francisco in Porto! First things first, you need to get a ticket. Quite weird for a place of worship to have an entry fee but since the ticket covers the small museum and the catacombs next to the Igreja I guess it’s a fair deal. Speaking of the museum and the catacombs, they are nothing awe-inspiring but since you’ve already paid for them, go spend 15 minutes and take a look. The church however is…just prepare to have your jaws dropped to the floor once you enter. Incredible attention to details, with three naves coated in (real) gold carvings and a huge wooden statue depicting the family tree of Jesus, at the altar. 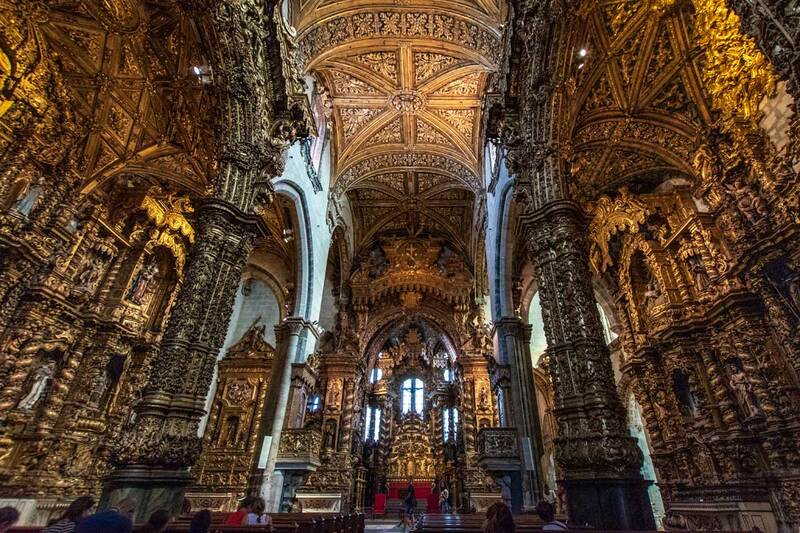 It is believed almost 300 kg of gold was used for the ornaments of São Francisco. It was even considered too extravagant for its time and closed for a while. November – February: 9 am – 5:30 pm. March – October: 9 am – 7 pm. July – September: 9 am – 8 pm. CastawayTip: If the cashier offers you the info brochure, don’t take it. 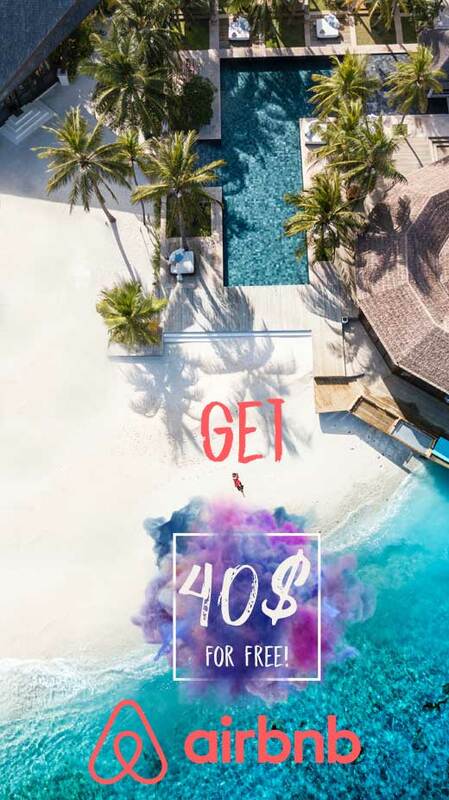 It’s not free and will set you back an euro. To visit Igreja de São Francisco is one of the 1700+ ideas I have on my bucket list. See what else is on it! We started the day with a coffee at the of the Duoro river’s coast, and it’s time to end it the same way – with a dinner at the riverside…but this time on the other bank. The last activity on our 2 days in Porto itinerary is merely a dinner at one of the restaurants of Gaia. 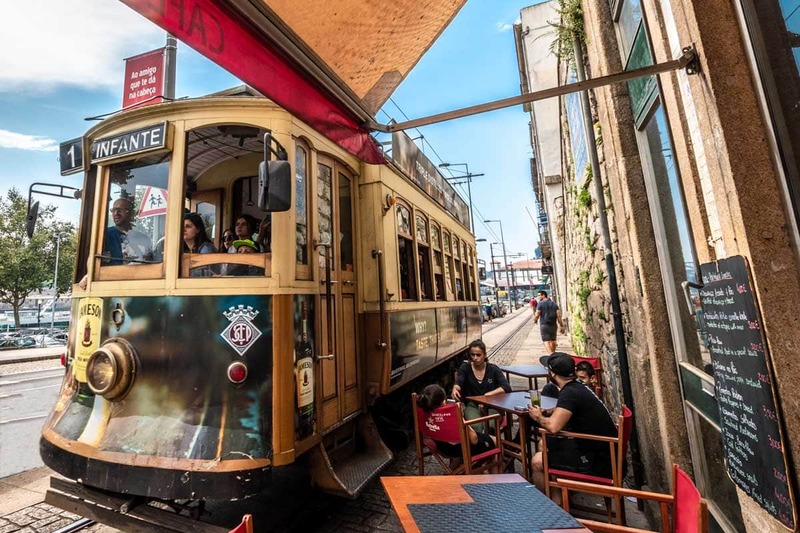 Vila Nova de Gaia, or simply Gaia is the area on the other side of the bridge, and it’s the best way to enjoy a local cuisine while enjoying a panoramic view of the Ribeira district. 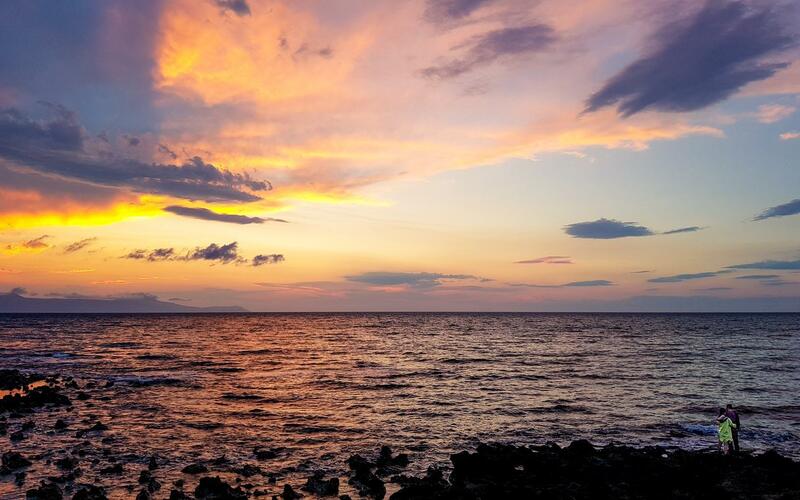 Add a warm pink sunset to the equation and have one of the most magical evenings of your life. 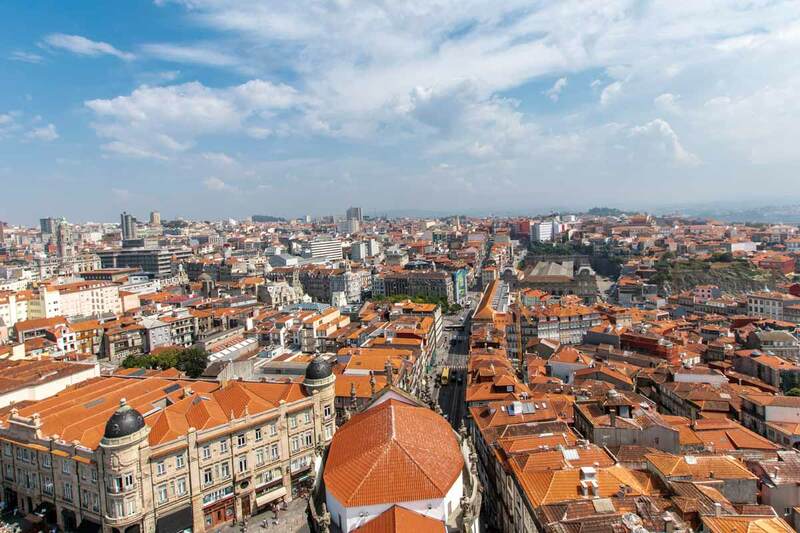 Porto is a very walkable city, so the good location is the essential you’re looking for. 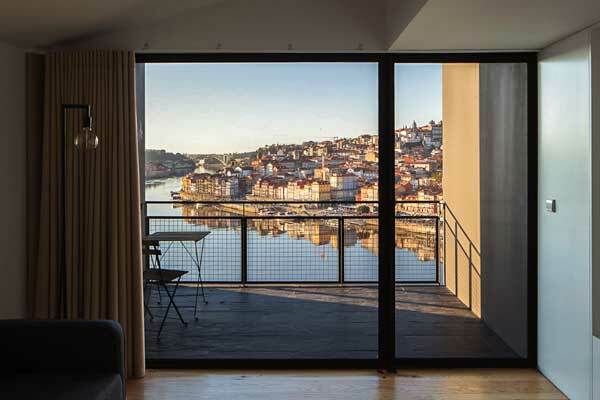 At the end of the Dom Luís I Bridge, the most significant trait of those minimalistic furnished apartments is the stunning panoramic view over the Ribeira district. Right next to most of the wine cellars of Porto and the Gaia cable car the only downside of those apartments is that you may not want to leave them and explore the other parts of the city. Situated right next to the Clerigos church, there is a hardly more central place you can find. Spacious, bright and offering a fantastic view, those apartments have everything you need to make your stay in Porto a memorable one. 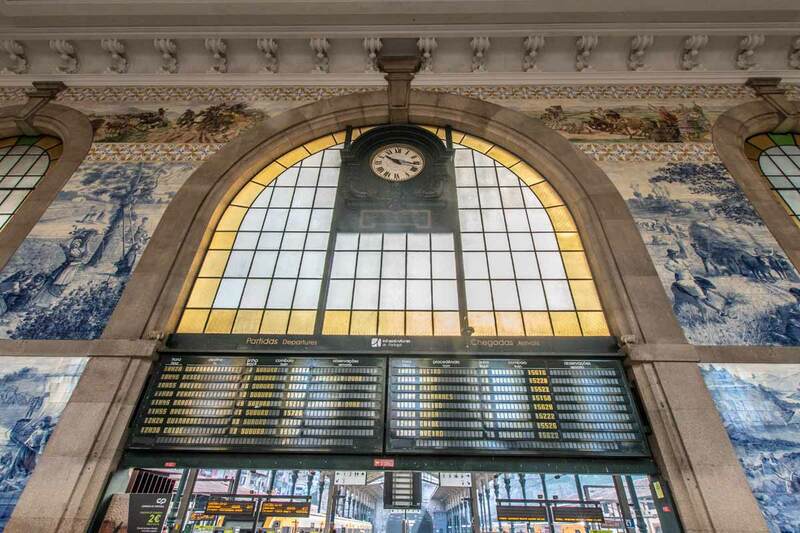 5 minutes away from Sao Bento train station, terrace with a pool and cute, movie-themed rooms. 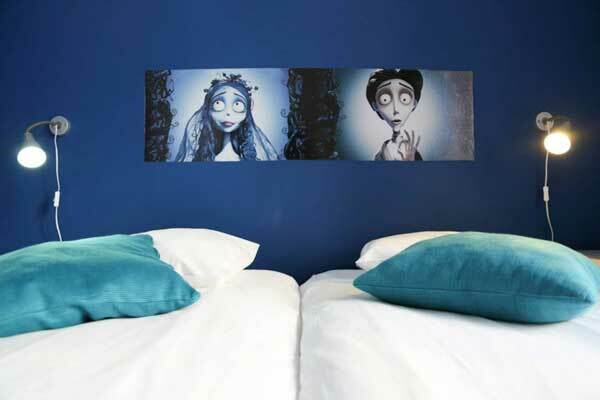 More than a perfect place for all of us who are on a budget. Best thing to do in Porto is just walk around and enjoy the atmosphere. The Summers in Portugal are very hot while the Winters are obviously not the best time for walks alongside the river, so Spring (March-May) and Autumn (September – November) are the best times for a visit. 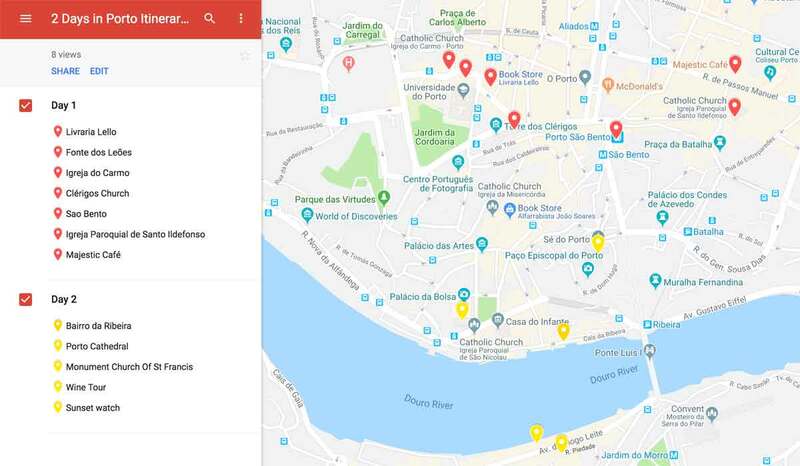 How to get around Porto? Walk, walk, walk! 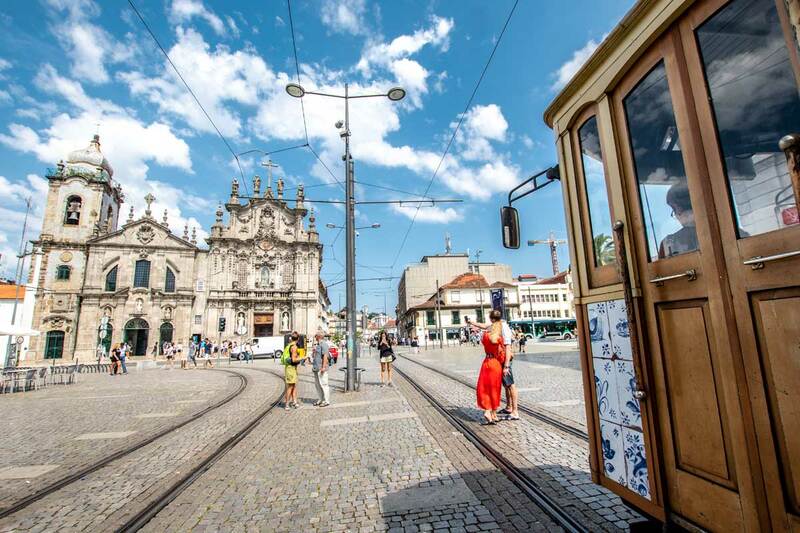 Don’t be focused on your end destination, Porto is all about enjoying the journey to it. If you get too tired though, you can always use the highly developed metro system or a public bus/ tram. If you are a fan of those things, you can also get the Hop-on Hop-off bus. As safe as a big city can get. Be aware of pickpocketers when visiting crowded tourist attractions, and inside the trams. 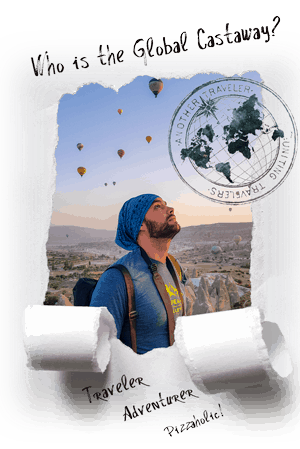 To save yourself some worries, do what I do – get travel insurance! If you have 2 days in Porto and you want to see more of this beautiful country, the city is a great starting point for exploring northern Portugal. 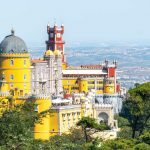 From the incredible sites of nearby Braga to the stunning vineyards of the Duoro Valley, the northern Portugal area has plenty to offer! The metro ticket costs 2.60 Euro and can drop you almost anywhere in the city center. CastawayTip: Don’t throw away the card. It’s a rechargeable one and it costs 0.60 cents. That’s all from me, I hope you enjoy your 2 days in Porto! 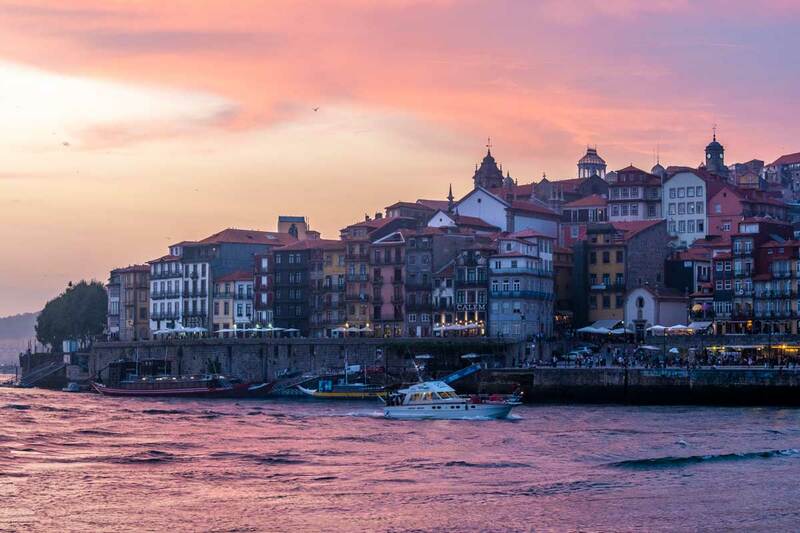 Have you been to Porto?